Today I am featuring a guest blogger – my mother. She has recently discovered the wonders of coconut oil and wrote an essay about it for her writing club. While I realize she’s being a bit hyperbolic (how’s that for a fancy English teacher word! ), I do think this stuff is amazing. Since reading her essay, I’ve been using coconut oil as a face cream, body lotion, lip balm, and as an added ingredient in my morning smoothie (recipe to come). I love having this all natural, all purpose moisturize. I can’t wait to see what else this miracle goo will do. Another step toward clean living! Yes! And now the wonders of coconut oil…. 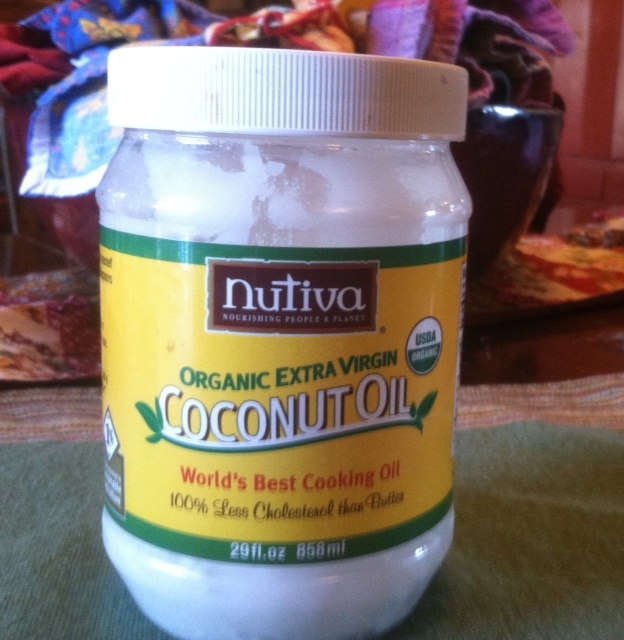 Last week I talked my friend, Sharon, into buying coconut oil. I had received one of those know-it-all emails about how coconut oil lubricates the brain allowing better cognitive thinking. It has even been known to slow down Alziemers. It doesn’t really lubricate the brain, but I can’t remember the clinical description of what it actually does. Yesterday Sharon called to ask how much coconut oil is recommended daily. She was a bit concerned when she opened the jar and found some goo with the consistency of Crisco. It looked neither appetizing or particularly lubricating. It looked like you could caulk around a bath tub with it. So I googled it. Low and behold, we have stumbled on a miracle product. We need to go back for more. We should keep it in our kitchen, in the bathroom or utility room, and even in the car. Sharon need not worry about her arteries getting clogged up with the stuff. It will have her blood sailing though her arteries like the flood waters of Osage Creek. But that is not all. It is an anti-inflammatory, so toss that Ibupropen. It is an antifungal. Athletes foot or toe fungus will clear up in no time with a few applications. It improves nutrient absorbtion. Who couldn’t use a little more absorbtion? And to top it off, it is antiviral. The next time the tummy bug comes knocking, he will be turned away before your tummy can even growl if you have loaded it with coconut oil. Those are the just some of the health benefits of coconut oil. But there are many more. At the risk of sounding like a snake oil salesman, let me extol the benefits of ingesting coconut oil and the miracle cures possible by just rubbing it on your person or anything else that might need curing. Do you have head lice, thrush, gall bladder pain, hemorrhoids? Or how about canker sores, flaky skin, even cellulite? Got cold feet? Slather on some coconut oil. Swimmer’s ear? Add a little garlic and drop it in. Coconut oil will calm that tick bite in a flash, and smother those little chiggers all while softening your skin. And what about beauty aids? You can pitch out all of your high dollar creams and serums. Coconut oil reduces puffiness around the eyes, and moisturizes your face and neck. Wrinkles be gone! Have you ever gotten a good look at the women of the Phillipines? They feast on coconut daily and live in the sun, and nary a wrinkle. And when you do get your lovely toned face all done up, coconut oil will remove eye make-up in a jiffy. Combine it with baking soda and you can throw your deodorant away too. Hikers? Forget about those chemical repellants. Mix a little coconut oil with peppermint extract and rub it on. Those skeeters will quickly buzz away for a less fragrant target. And how many of us have to bother with that annoying chewing gum in the hair? Roll in the oil, leave it 30 minutes, the roll the gum between your fingertips, and Voila! Its out! And for all you trappers and hunters, it will season your animal hides. If you apply coconut oil to your head in a circular, massaging motion, the natural aroma of coconuts will lower your stress level. And the saturated fats in coconut oil have anti-bacterial properties that help with digestion problems, including irritable bowel. It will stimulate your metabolism, improve thyroid function, and boost your energy and that my friends, will decrease fat and increase muscle. This stuff is a miracle food. There is an article in Health Impact News Daily about how coconut oil can change your life. It called. Holy Smokes! I’m healthy! This guy heard it would cure his mononucleosis quicker and it did. Then he decided to apply it on his “trouble spots”. It has cured his acne and the ringworm on his back, his oily skin, a cyst on his backside, and bleeding gums. He is no longer losing hair, and his irritable bowel is under control. And it even got rid of his jock itch! Need I say more? I am amazed. Coconut oil is the answer to so many mysteries and complexities of life. I am ready to start buying it in 5 gallon increments. So when the health food store has a run on coconut oil, I will be secure in that fact that I’ve got a lovely bunch of coconut oil.